The Miseducation of Cameron Post is a classic coming of age story. Cam is a character who you will come to care for and root for. 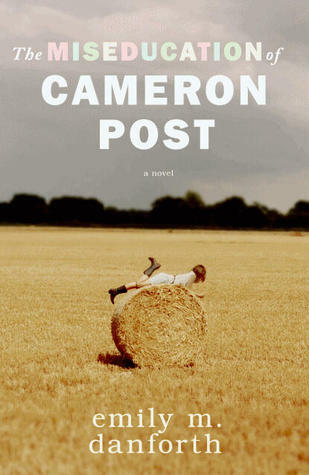 The book begins when Cam is about twelve and living an All-American small town life complete with swimming, teenage hijinks, and young love. Like most young teens and tweens Cameron is discovering romance. To her surprise and fear, she realizes she is attracted to girls. It is at this fragile time that Cam’s parents die in a tragic car accident. The book shifts gradually several years. Cam lives with her very religious Aunt and her grandmother. She spends most of her time messing around with her guy friends and falling in and out of love with various girls, making sure to keep her sexuality a secret. The book shifts again when Aunt Ruth discovers that Cam has been having relationships with girls. She sends her off to a Christian school geared toward “curing” homosexual youth. There, Cam encounters loneliness, restrictions, and judgment, but also makes great friends who understand her better than the people in her small town. As I said at the beginning of the review, Cam is the star of this novel. I loved her. She is emotionally reserved, but you can feel the sadness and anger boiling up within her. She is somewhat rebellious, but not overly so - she doesn’t go out of her way just to prove a point like some of the other characters in the novel. I also loved that she kept an open mind about almost everyone. A lot of people in her life were trying to hurt her or hold her back, but she didn’t flatly demonize them. Cameron’s open mind influenced my opinion about all the characters. I easily could have hated Aunt Ruth or Pastor Rick or Lydia - the people who were trying to “cure” Cam - for not realizing that they were doing far more harm than good. But because of the writing and Cam’s outlook, I was able to view them with empathy and some sympathy (well, maybe not for Lydia). Aunt Ruth and Pastor Rick were well-intentioned if misguided. Cam’s friends were also well-developed three-dimensional characters. We got to know Jamie, Adam, and Jane Fonda the best. None were perfect and none were characters I would have been friends with, but I understood them. Emily Danforth’s writing is fabulous. I particularly loved her descriptions of Montana. She made the setting come alive with its rugged beauty. In fact, everything came alive - the characters, the plot, and the setting - through her prose. Ms. Danforth clearly has a literary bent. Call me pedestrian, but I don’t always like reading “literary” novels. The prose tends to overshadow the plot. There were a few instances were I thought the writing started to get in the way, but for the most part, the beautiful prose enhanced the reading experience. A few complaints though. First, the book is long. Llllooonnnngggg. Almost 500 pages! It’s a character driven novel that meanders through Cam’s teenage years. 200 pages easily could have been filtered out and the book wouldn’t have suffered much. Because of its length, it dragged quite a bit. I remained interested in the story throughout the book, but I would have been happier if it was shorter. Second - not as much a complaint as it is personal taste - there was a lot of drug use, alcohol, and language in this book. The prevalence of pot smoking bothered me most. On one hand, it’s a realistic reflection of many teenagers’ lives. I think that YA should reflect teenagers as they are not as they should be. On the other hand, I really don’t approve of teenagers being potheads and prefer books that show the negative effects of drug use in addition to the fun times. It made me uncomfortable with the book. But as I said, that’s not a flaw per se, but more about my reading tastes. On the whole, The Miseducation of Cameron Post was an extremely well-written, engaging book with characters that I cared about. I would love to read a book about Cam’s life in her mid-twenties to see where she ends up. I don't like reading books that drag . . . but I'm still interested in this one. Great review! Fantastic review! Even with the pacing issues and other negatives this still sounds like a good book. I am glad to hear that the main character is so well written. I am planning to buy it for my library. I'm really curious about this book. Despite the points you mentioned (whhhy are so many YA books 500 pages now?) it sounds like it may still be worth checking out. Thanks for the review! Ooh, well developed characters, YAY! This is the first review I've read of this book. I don't mind long books as long as they aren't the ones that have four places that feel like the book should end, yet they keep going. I will definitely be keeping an eye out for this one! I'm really excited to read this book. It sounds wonderful. I didn't even realize how long this books was though. Yikes. We had similar issues with this one, but I think you liked Cam a bit more than I did. I just missed the introspection in this book. I kinda wished she cut more of the drug usage and added more discussion. I felt like Cam was just a leaf blowing in the wind, you know? 500 pages is definitely lengthy, but it sounds like Cam is a wonderful character and usually that's enough for me to stay interested even when the story overall could easily have been shorter. The whole idea of their being a "cure" for homosexuality is repulsive to me, but I'm curious to see how Cam deals with it. Fabulous review Alison! This sounds so interesting. I don't mind reading long books, even 500 isn't terribly long to me, but if it drags I don't know. Would love to see other reviews of this book. Thanks for your thoughts. Oh, I didn't know about this debut novel. It sounds fantastic. Thanks for the heads up that it is long. I tend to wait to read those until I can devote a lot of time to the novel. Adding to my wishlist. I'm excited to give this one a try. I'm sorry to hear it's so long, but it still sounds fantastic! I'm glad that you enjoyed it, despite a few of these things. Wow. That is a long book. But the MC sounds so awesome, I'll probably check it out (even though I can hear my students whining about me book talking another LONG book.). While, I really appreciate when setting is just as much of a character as the protag, with rich descriptions and all, I think I'd have the same problems as you with this one. I'll probably be skipping this one, but I like how Cam's struggles and development seem to have been thoughtfully executed, even if a bit too long. Wow, I had no idea that this one was so long. I can do long books, but it's worse if it feels like they drag and you feel like you could have easily docked 200 pages. Then again, it might not be so bad if I enjoy the characters and writing so I'm still going to add this to my tbr. I wish there were more books that had lgbt subject matter!